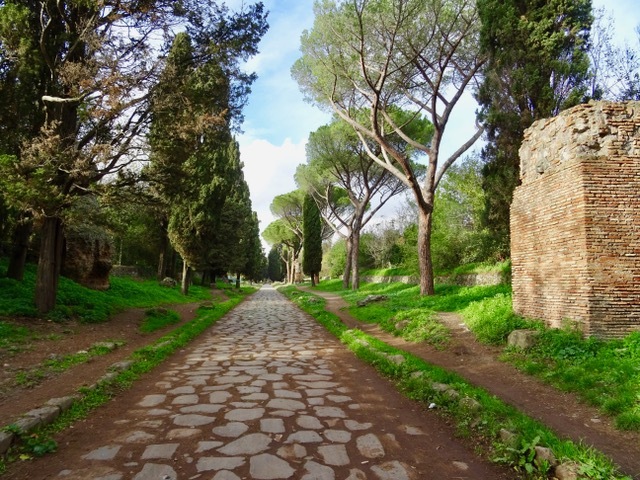 The Appian Way was Europe’s first super highway. 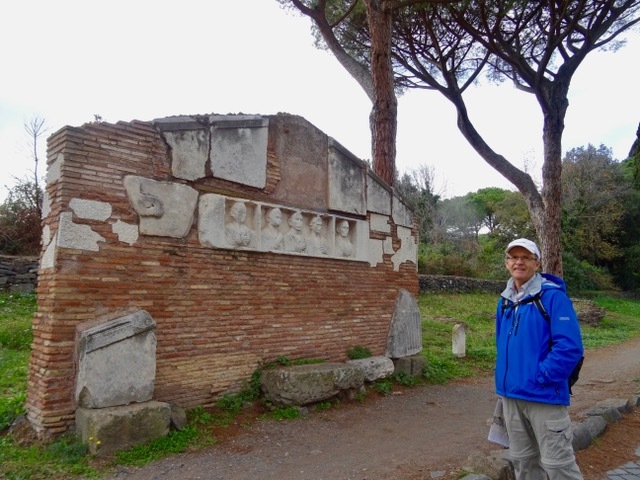 It is the reason for the saying “All roads lead to Rome.” Built in 312 B.C., it connected Rome with Capua (near Naples), running in a straight line for much of the way. Eventually it stretched over 600 kilometres to Brindisi, on the east coast of Italy. 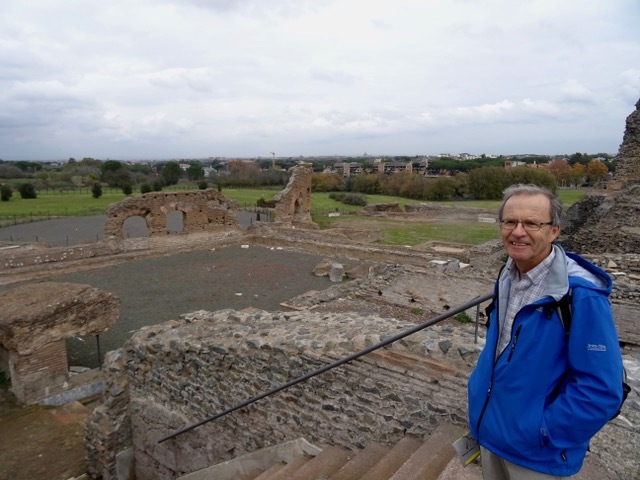 Today is Bob’s birthday and we are going to walk the Appian Way. We take the metro and then a bus to the outskirts of Rome. 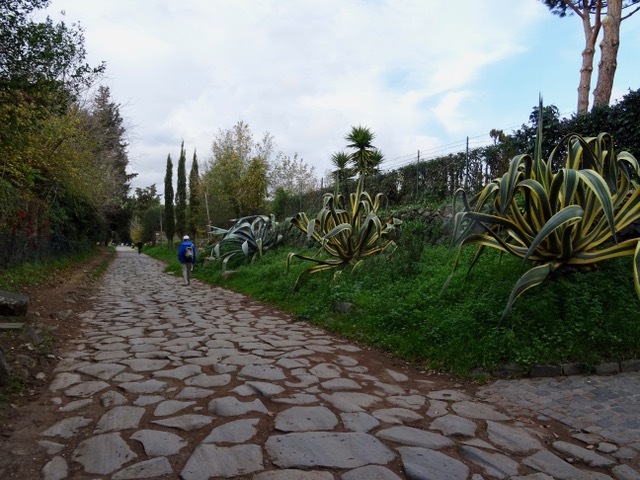 Before we start our walk back into Rome we walk a bit further in the opposite direction to visit the Villa Dei Quintili. We buy our €5.00 tickets and when we walk up to the building below it is all locked up and under construction! Turns out this isn’t the villa, and we need to walk along a dirt path behind this building for a ways to the ruins. 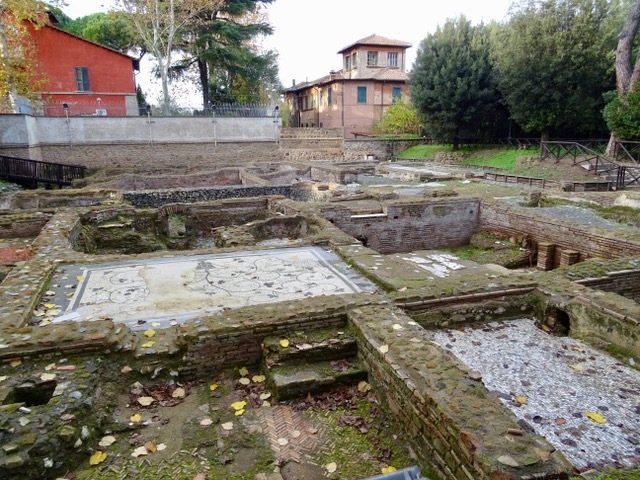 The Villa Dei Quintili was the largest villa complex in the suburbs outside Rome. 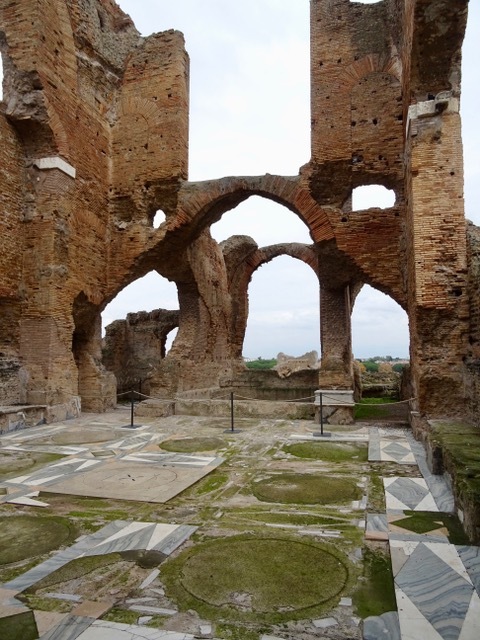 It was built by two brothers, who were later executed by Emperor Commodus who took over possession of their villa. It was then expanded and used by emperors until the 5th century. 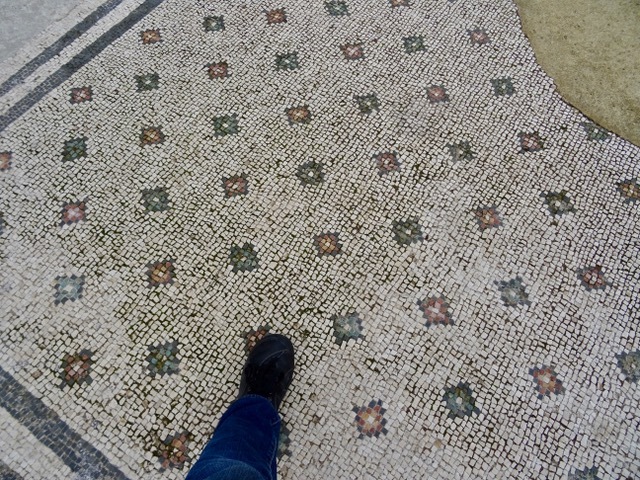 There are boardwalks in many areas but sometimes we are walking on the original mosaics floors! Hard to believe that this is allowed. 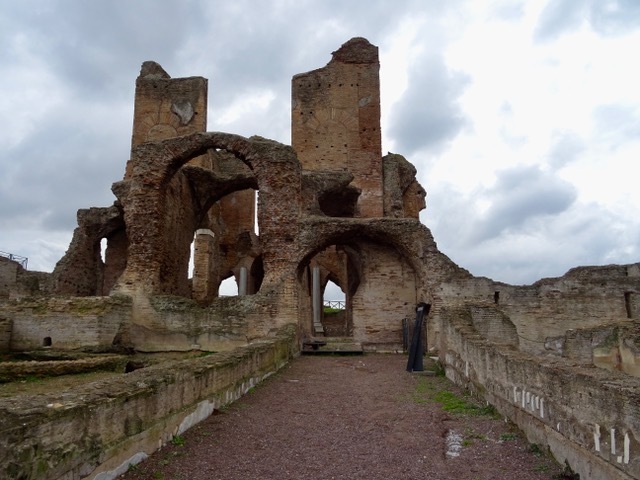 There are baths here with a calidarium (hot water) and a frigidarium (cold water). 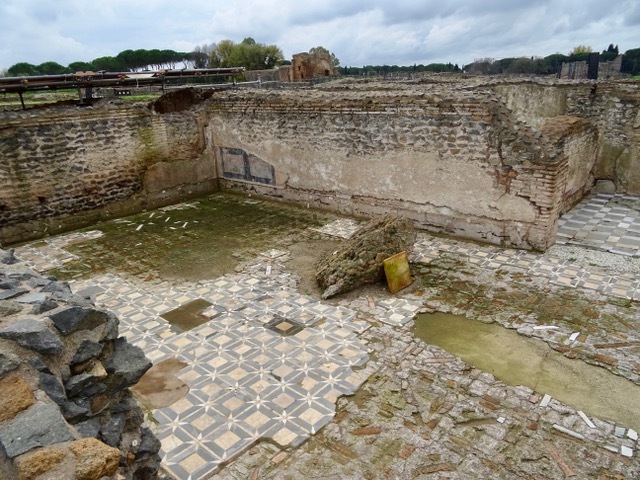 Many of the rooms have remains of mosaics and floor tiles. A few even have traces of frescoes on the walls. This all covers a huge area and it was all one villa. When it was first excavated it was thought to have been a town! 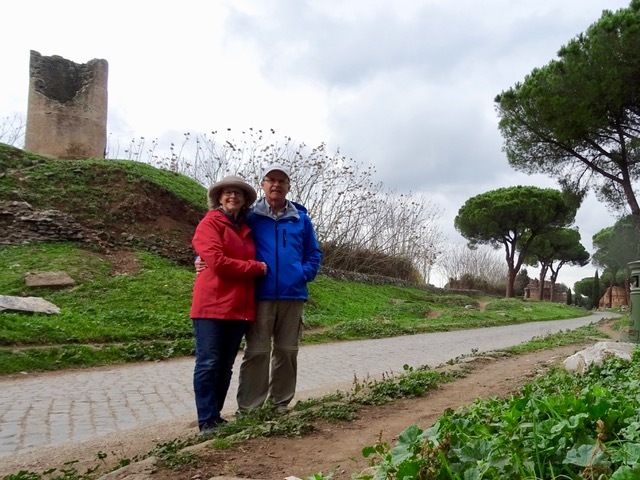 Back on the Appian Way we are ready to start our walk towards Rome, on the same road that was used by Romans almost 2,000 years ago! 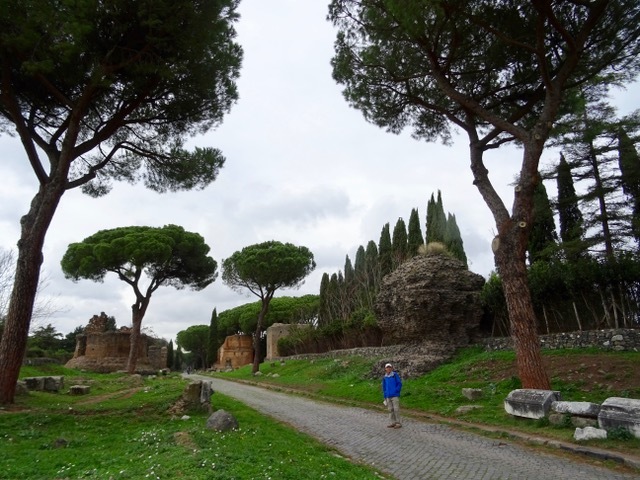 We are going to walk in the footsteps Roman Emperors, merchants, saints and maybe even St.Peter! Julius Caesar travelled this road along with thousands of soldiers, and now we are too. 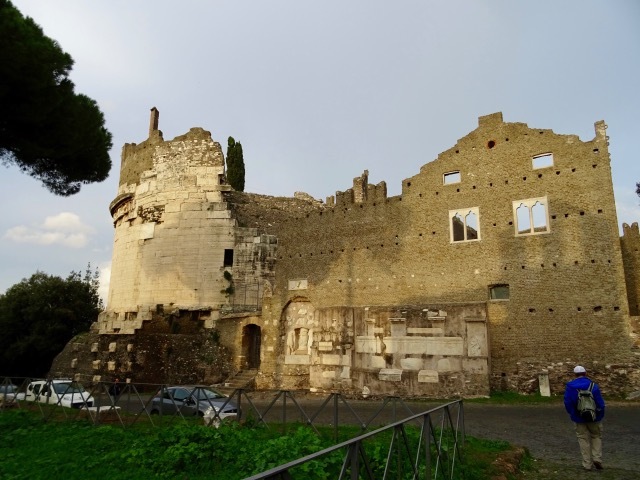 Romans did not allow anyone to be buried inside the city walls so many people were buried along the roads leading out of Rome. Wealthy people built impressive tombs for themselves. The remains of many of these tombs are visible today. Sometimes there is as little as a mound of earth but there are also still quite impressive remains of the larger tombs. These are the original stones that were used to build this road. These stones were set upon a bed of gravel and cement. Lime cement was then used to fill the gaps between the stones and the road was said to have been so smooth that the joints between the rocks could not be felt. In the foreground the ruts made by ancient chariot and wagon wheels can be seen. 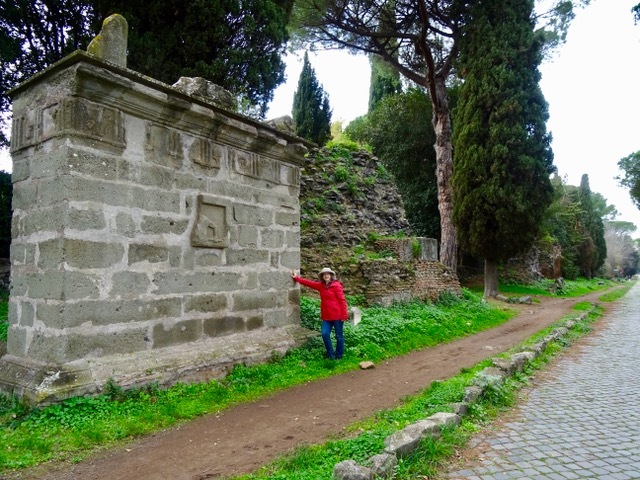 One of the many ‘reconstructed’ tombs along the Appian Way… and a couple more. The day started out cloudy and cold but the sun came out and warmed us up. 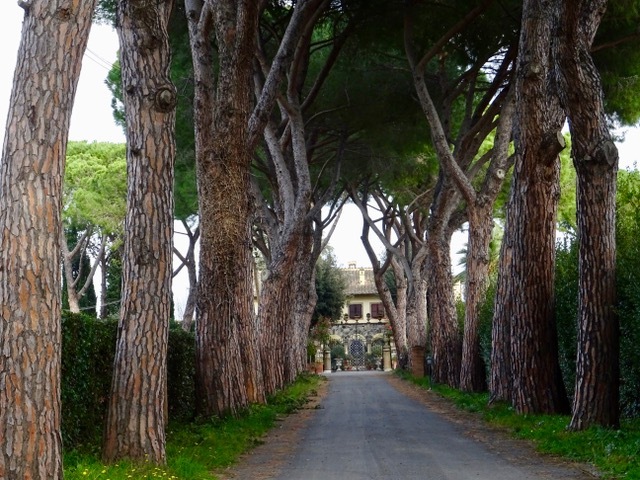 There are many grand modern villas along the Appian Way. This is looking down just one of the many long tree-lined driveways we see along our walk. Getting closer to Rome. It is a bit tiring walking on these original paving stones. The cement that made the road smooth has long worn away. We saw lots of people bicycling along here and it looked bone jarring. This is a small archeaological area along the road that used to be a farmer’s field. Some of the floor mosaics show where they were damaged by the plows used to till the fields! Fall has arrived. 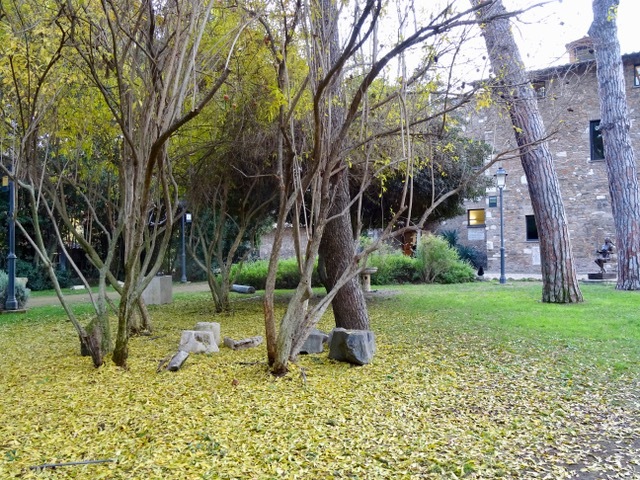 The leaves here were a beautiful golden yellow. 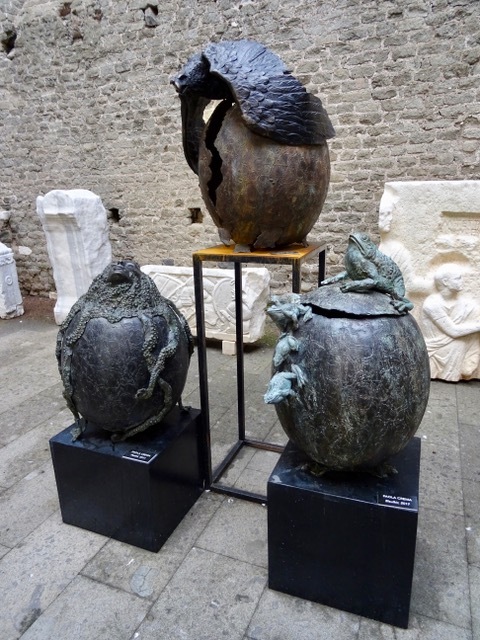 Inside the Tomb of Cecilia Metella, one of the best preserved tombs along the Appian way, there is an exhibit of modern sculpture by Paola Cream. I like this bird man… and these vessels. The exhibit sign said the show only runs until November 11th, but this is Rome and not everything is what it says it is. 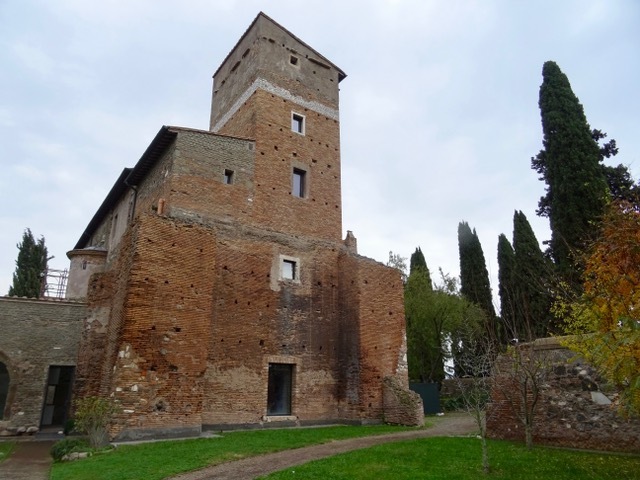 This is the outside of the Tomb of Cecilia, who was noble woman in the 1st century B.C. Inside the hollow round tower is where her body is thought to have been buried. That was our last stop of the day. The ruins are closed at 4:00 and we still have a a walk and then a bus and metro ride to get home. we ran out of time to visit the catacombs so we will have to return another day. 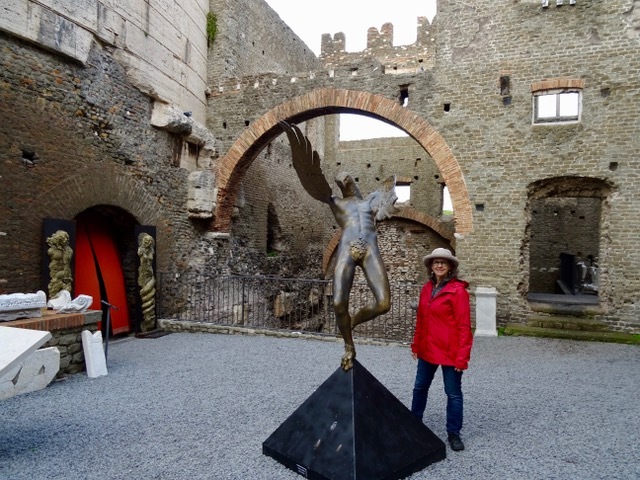 This entry was posted in Appian Way, Cemeteries, Cobbled Streets, Historic Buildings, Italian towns, Italy, Monuments, Mosaics, Roman Ruins, Rome, Sculptures, Shrines, Uncategorized and tagged Ancient Mosaic Floors, Italian towns, Italy, Roman Ruins, Sculptures, The Appian Way, The Villa Dei Quintili, Tomb of Cecilia, Vacation by Trudy. Bookmark the permalink. I can’t believe people bicycled down that road! Brooks saddles with springs would help, I suppose! I don’t know what Brooks Saddles are or if they would help, but the people riding might have appreciated them. Some of the time they were able to ride beside the road on dirt tracks. Happy belated birthday to BOB! I only read this today. 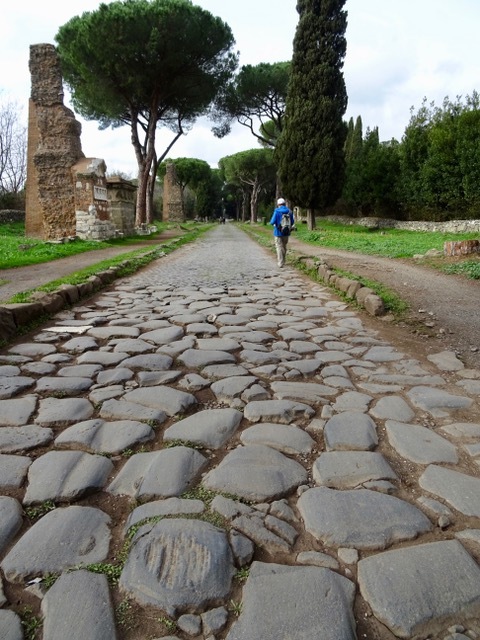 Quite an impressive road & it is surprising that they allow people to walk over the original mosaics. Perhaps it should be covered with plexiglas. I think plexiglass might trap moisture, but at least a boardwalk over the part where people walk would make sense to me. I’ll pass on the Birthday wishes.